Sing a song of sixpence, a pocketful of rye. Legend has it that at the lavish wedding feast of Marie de'Medici and Henry IV of France, a spectacular pie was presented to the couple. When this enormous pie was sliced by the servants, out flew twenty-four songbirds, soaring into the palace rafters to serenade the astonished guests. That's one way to make a lasting impression! I'd love to be invited to such a magnificent party, though I can't say I would eat the pie after knowing it had been stuffed with live birds! 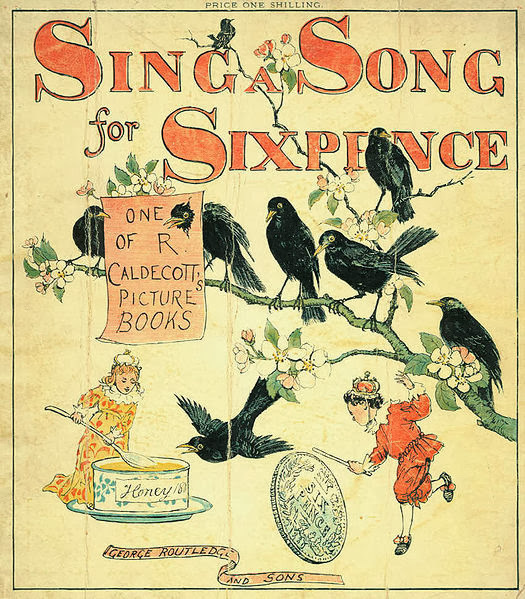 I remember being captivated (and a little horrified) by this nursery rhyme as a child. Did they really bake the birds alive??? I'd ask myself, and then try not to think about it. Then, one day, my mother made a blueberry pie, and there, right in the middle, sat the protruding head of a black bird. Not a real bird, but a pretty, antique pie bird which she'd inherited from her grandmother. I sighed with relief because at last I understood the rhyme, or at least I hoped I did. Still today, I find the idea of a pie bird utterly charming. So, when my mother requested cherry pie for her birthday last week, I couldn't resist adorning it with my own little pie bird. Alas, mine is not black; it's Le Creuset red to match the cookware my husband faithfully surprises me with every Christmas. But it's still just as much a show-stopper as the one I remember my mother using. And the surprise in my children's eyes when I brought the pie to the table was priceless. It was late and in the excitement I managed to snap just a few photos before the pie was gobbled up. C'est la vie! You must act fast if you want the take pictures of pie! 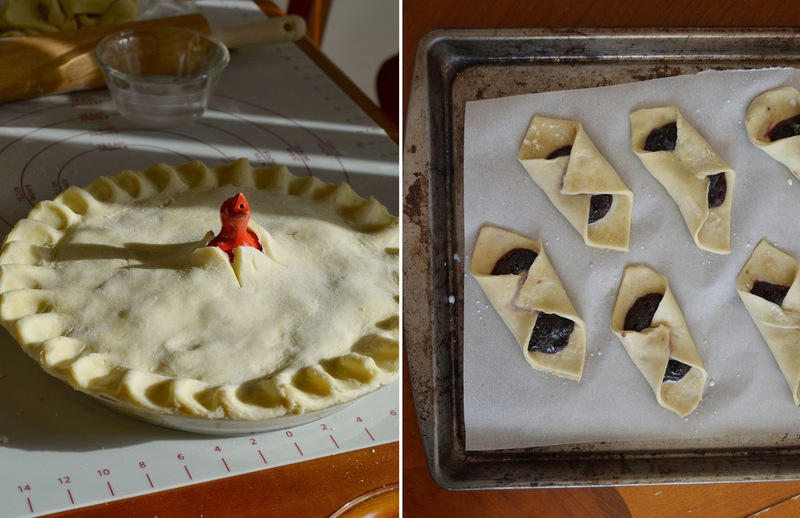 Not only does a pie bird look adorable, but it serves a very utilitarian purpose. It vents the pie. And this it does exceptionally well, as it vents from the bottom of the pie instead of the top. This keeps the bottom crust from becoming soggy. It also supports the top crust so it can brown and become crisp and flaky. 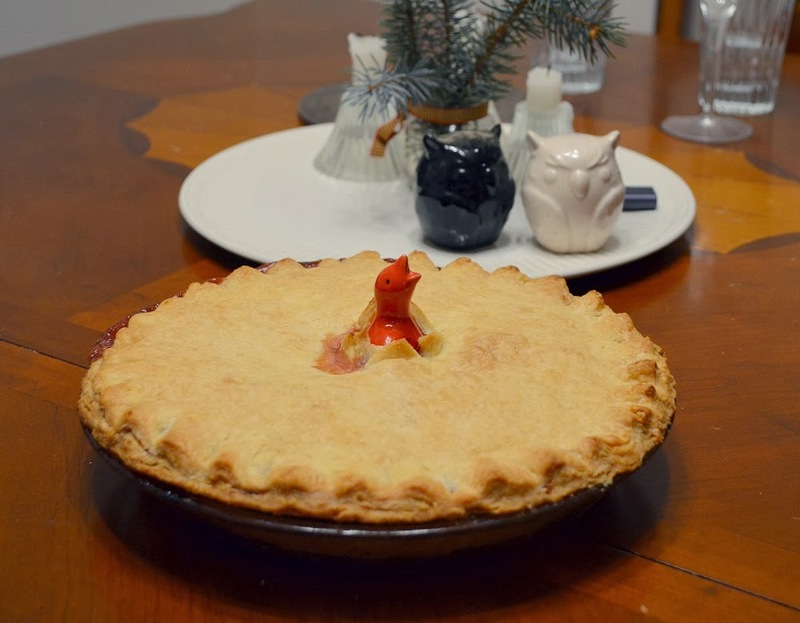 Really, a pie bird is a must for any avid pie baker (and it fits nicely in a Christmas stocking, as well). Of course, as I've mentioned before, I always make a little extra shortcrust pasty dough for my grandmother's Kolaczki. 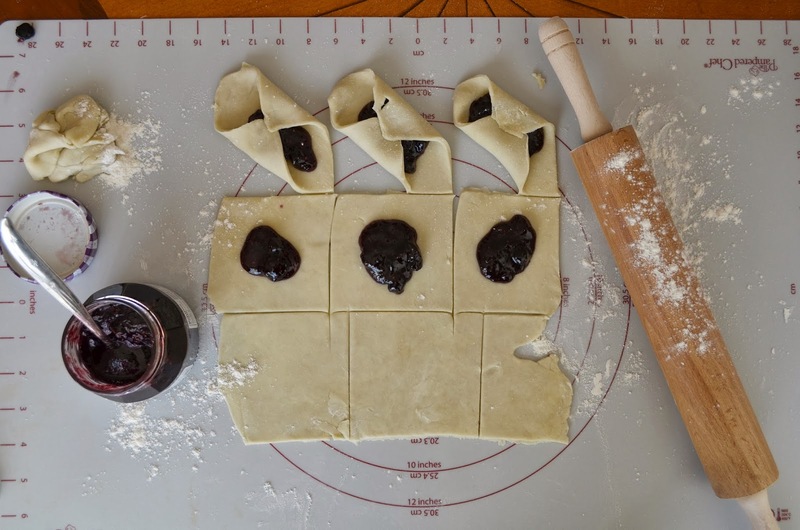 This recipe makes enough pastry for a covered cherry pie and 12 Kolaczkis. I stored the dough tightly wrapped in the fridge. Later in the week, when the kids were clamoring for cookies, I retrieved the stashed dough and made these triple berry Kolaczkis. I garnished them with coarse turbinado sugar for a very satisfying crunch. The perfect, quick mid-week treat. If you like this, you may want to check out this Plum & Cherry Honey Crisp or The Vanilla Sweetheart Cake. Mix together the flour, sugar, and salt. Cut the cold butter into small cubes. Using a pastry blender, a fork, or two sharp knives, cut the butter into the flour until the mixture is evenly moist and uniform. Add the water and continue mixing until the dough comes together. Divide the dough into two pieces, one slightly larger (for the bottom crust) than the other. Press each piece of dough into a disk and wrap in plastic wrap. Refrigerate for at least 1 hour. Traditional cherry pie is made with almond extract. I make mine with lots of vanilla instead. Cherry and vanilla is such a classic combination and, of course, it's nut-free! Preheat the oven to 425 F (220 C). Generously butter a 9 inch pie plate. Roll out the larger of the two disks of pastry dough to approx. 1/4 inch thick. This should give you a 12 inch round of dough. Flour the top of the dough and roll it gently onto the rolling pin to transfer to the pie plate. Carefully unroll the dough into the pie plate and press it into the shape of the plate. Trim the overhanging edges leaving approx. 1 inch of dough around the edge. Wrap the excess dough in plastic wrap to save for later. Place the lined pie plate into the refrigerator while you make the filling. Drain the cherries, making sure to reserve 1/2 cup of their juice. Place the cherries, the reserved juice, sugar, cornstarch, lemon juice, vanilla extract, and the vanilla beans in a bowl and mix carefully. Set aside while you roll out the top crust. Remove the second pastry disk from the fridge. Roll this one into a round that's approx. 1/4 inch thick. Cut an X in the center of the crust (for the bird's head). Remove the bottom crust from the fridge. Place the pie bird in the center. Pour the cherry filling evenly around the bird. Dot with a few tiny bits of butter. Brush the edge of the bottom crust with water. Dust the top crust with flour and roll onto the pin. Unroll the top crust onto the pie making sure the bird's head peeks through the X in the center. With a sharp knife, trim away all the excess crust using the edge of the pan as a guide. (Wrap all the excess dough in plastic wrap and refrigerate for Kolaczkis later in the week.) Press together the two crusts and firmly crimp with a fork or flute with your thumb and finger. Bake in the lower third of the oven for 30 minutes. Turn the oven to 350 F (180 C) and place the pie on a sheet pan. Move it to the upper rack and continue to bake for an additional 35 - 40 minutes, until it's bubbly and the crust is nicely browned. Allow to cool on a rack to room temperature before slicing. Serve with freshly whipped cream. Preheat the oven to 375 F (180 C). Line a sheet pan with parchment paper. Roll the pastry out to 1/4 inch thick and cut into squares that are about 3 x 4 inches. Place 1 tsp of jam in the middle of each square. Fold opposite corners up to the middle and secure with a little jam (see picture above). 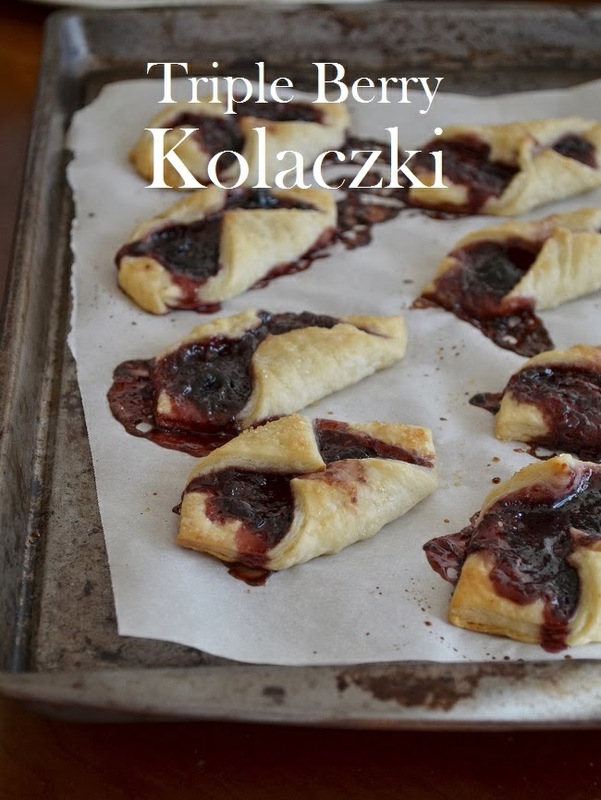 Brush each kolaczki with milk and sprinkle generously with the turbinado sugar. Bake for 15 - 17 minutes until golden brown. Don't worry if some of the jam oozes out as they bake. These bits of caramelized jam are my favourite part! Oh how I miss pie…. your post and photos brought bake some wonderful childhood memories!